I think while we were all enjoying the comfortable status quo Gridman was settling into, it’s episodes like these that remind me why it’s undeniably this season’s most intriguing show. 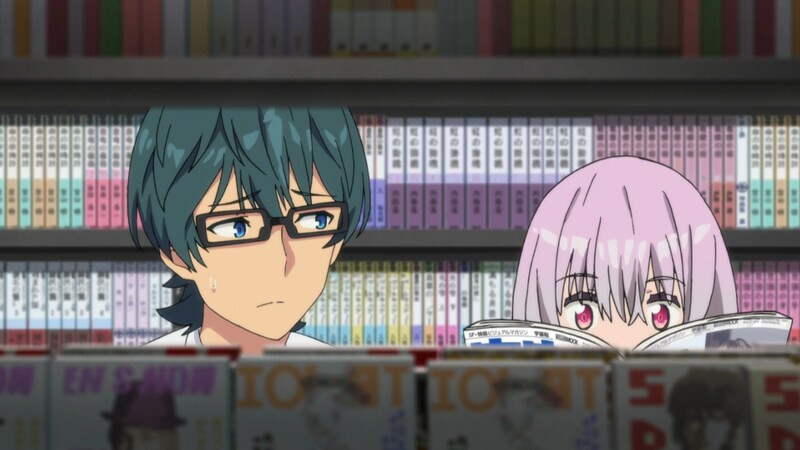 Building upon the established mysteries to introduce new ones, this week’s Gridman is a fantastic showcase in character writing and narrative presentation. Essentially, this episode is about three parallel interactions involving one of our main trio and a member of the “other” side, and the conversations that ensure. It’s a neat premise that helps bring more out of the characters. 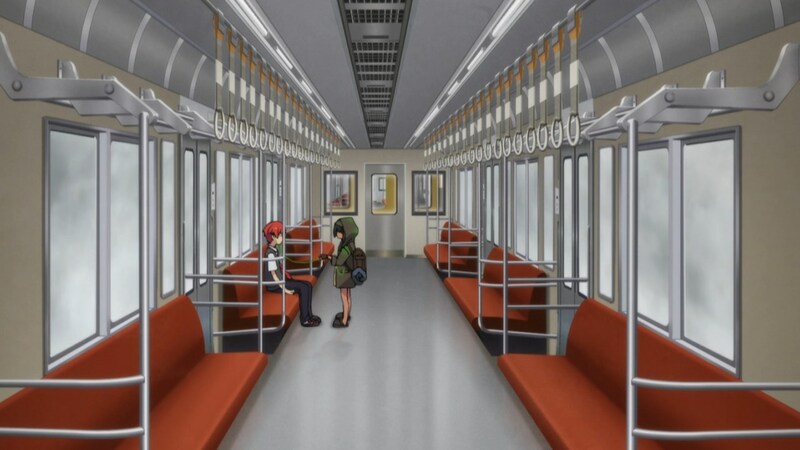 Yuta’s section is probably the star of the show when he finally meets the mysterious hooded girl that eagle-eyed viewers have noticed appearing in background shots of prior episodes. 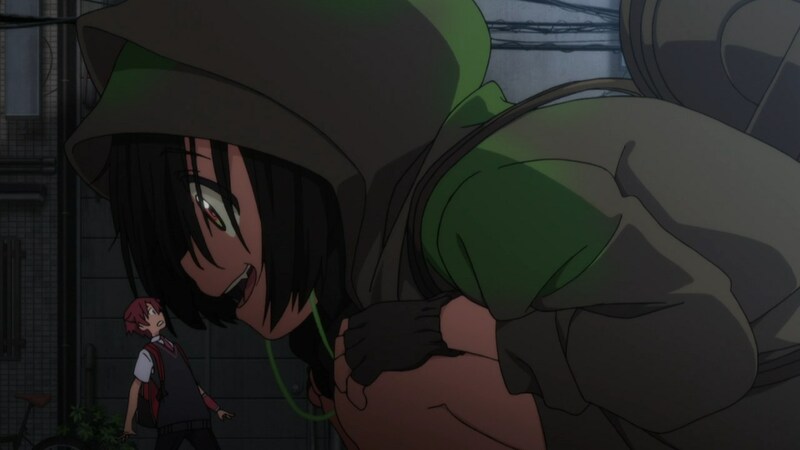 The unnamed girl reveals herself to be another Kaiju capable of taking on human form which leads me to wonder if she and Anti are connected in any way. In many ways, her conversation with Yuta is just a lot of exposition, but one that’s presented so interestingly that its actual effect is that it only add more layers to the mystery that forms the show’s foundation. Surprising no one at this point, Yuta’s new friend explains to us (through an amazing PS1-era low poly video) that the world they live in is one created by Akane. What this specifically entails remains to be seen, but certainly seems to be pointing us ever closer to the, “They’re in The Matrix” bet. 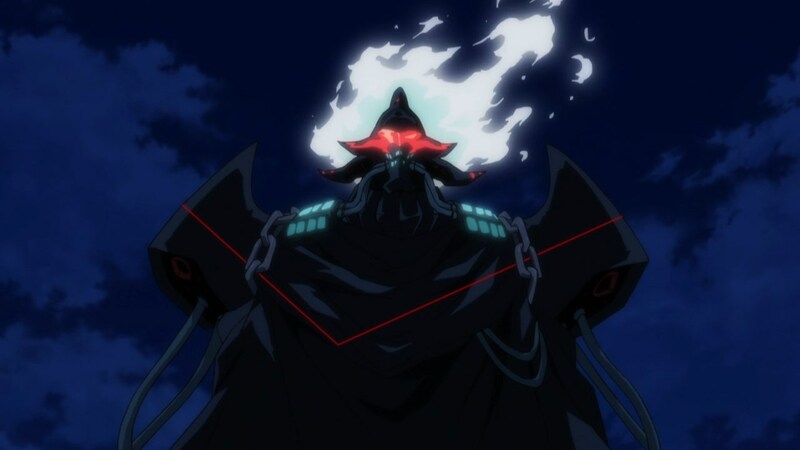 Throw in references to “my predecessor” and being a Kaiju that has existed long before Akane’s machinations and it’s an effective introduction to a new character that builds upon the show’s mystique. There is some excellent composition and animation during this part of the episode, from her jarring size growth to the delightfully off putting way her mouth is animated. A lot of other shows attempt to pull off the same kind of reveals and even if said reveals are more surprising or impactful, they often lack the flair to truly engage their viewers. Thankfully Gridman succeeds beautifully at making what is essentially an info dump feel meaningful and engaging to watch. In general, this episode has some fantastic shots, both subtle and brash. The show continues to reveal that it’s still a Trigger show with Trigger comedic and action sensibilities. There are some genuinely funny moments in this week’s episode that don’t require anything more than a couple seconds to work. 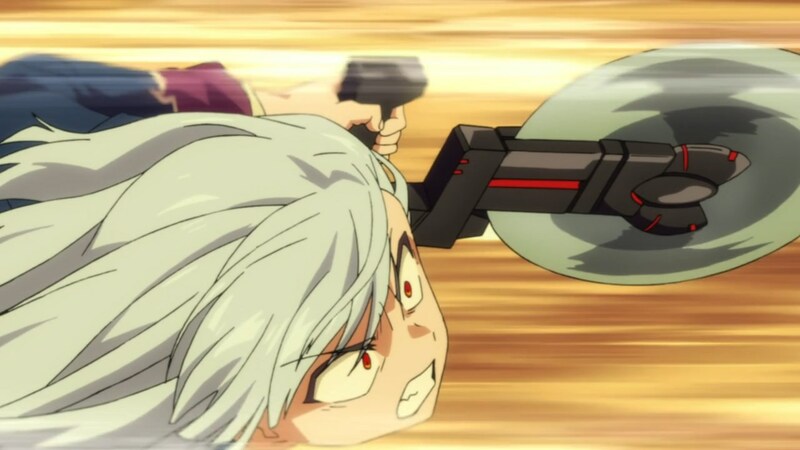 And it isn’t a long one, but the quick fight at the end between human form Anti and half the Neon Genesis Junior High crew show that they’re still entirely capable of busting out a decent little 2D fight when they want to. Elsewhere, we finally get a meeting between Sho and Akane. Even if it is entirely Akane just putting on a facade to get close to Sho to unravel Yuta, it’s a combination of characters a lot of us have been waiting for. Both of them being Tokusatsu fans lends the conversation an interesting angle and it feels entirely natural in the way two people discovering they like the same thing would. If nothing else, I’m glad Gridman is remembering that Sho also exists. Compared to Yuta and Rikka, Sho has kind of felt the most vestigial of the group, relegated to being The Genre Savvy Nerd. His conflicted relationship with Akane adds another interesting wrinkle to both their characters. By virtue of having explored this earlier, Rikka and Anti’s part of the episode is maybe the least conventionally interesting. Rikka takes Anti home to give him a bath upon realizing what a filthy gremlin bum he is. Overall it doesn’t add that much dimension to the characters that weren’t already there but you could also argue that Rikka was already one of the better fleshed out characters in the cast. That said, the show of genuine compassion from Rikka was enough to get Anti to consider that things might not be entirely set in stone. Overall, Gridman is the rare shining example of how you can do an exposition episode right. I’m being a little reductive here, there’s obviously a lot of other things this week’s episode does to elevate it above and beyond just an info dump with talking heads walking in circles. But at its core, this week’s episode is focused on introducing new developments and fleshing out our cast through new interactions. It largely succeeds on both counts and has brought back the mystique that got us all so interested in the show to begin with. I completely agree with your assessment. This episode was flat-out terrific – atmospheric, moody, and ominous – and this is easily the most compelling show of the season. I’m really enjoying this show. Perhaps it’s Trigger at its best.